The Pāda Yātrā is one of Sri Lanka’s oldest traditions. In an awe-inspiring display of devotion, pilgrims from a variety of backgrounds and religions come together to form a procession that makes its way, on foot, from Jaffna to Kataragama for well over a month. The Pāda Yātrā has been attracting close to 30,000 pilgrims a year since the end of the internal conflict in 2009. But there is an unseen side to this impressive gathering. When the 2018 instalment of the pilgrimage came to a jubilant end in Kataragama a few weeks ago, a Game Ranger based in Yala National Park borrowed one of his employer’s trucks and set out with five volunteers on an urgent mission: to gather up the plastic waste left behind by the procession as it passed through the park on the final leg of its journey. Having worked his way through a six km stretch which included the Warahana camp site, in less than a day, his trailer was overloaded with various plastic containers such as bottles, bags and cans, all collected from park roads and resting points. He went out proactively due to concerns that park officials would gather and burn the plastic inside the park. Failing that, he suspected they would transport the waste to the ever-expanding dumpsite between Kataragama and Lunugamwehera bordering the park, where 10 to 12 elephants are seen grazing daily. The ranger in question, one of only four Field Guides Association of South Africa (FGASA) certified game rangers operating in Sri Lanka today, emphasised that although the pilgrimage presented a special instance where large numbers of people are allowed to pass through the park on foot, that the Pāda Yātrā itself is not the problem; “the removal of plastic waste from within the national parks is a daily struggle and fast becoming a serious threat to the welfare of wildlife as well as a hindrance to park maintenance”. In January, as requested by President Maithripala Sirisena, the number of vehicles allowed into Block 1 of the park was raised to 600 per day to ensure that no visitors were turned away during seasonal peaks. At the time, the Department of Wildlife Conservation (DWC) claimed it was up to the task and the Director General M.G.C. Sooriyabandara told the Daily Mirror that “measures have been taken to control and minimise the damage caused to the animals by the increased number of vehicles entering the park”. However, concerned rangers and field guides who travel into the park with guests on a daily basis paint a different picture. With large numbers of vehicles entering the parks, certain things tend to be overlooked by officials. Despite the ‘Rules of the Jungle’ flashing on the Yala website, there are many eye-witness accounts of guests littering. Worse yet, with the hope of luring animals to the vehicles, tourists and local visitors alike are often seen feeding animals whatever they carry into the park as snacks, sometimes offering food without removing the plastic packaging. Although most legitimate safari companies operating inside the parks have strict rules on what guests are allowed to take into the park, there is still an abundance of non-degradable materials haphazardly discarded inside the premises. Park officials often accompany guests in vehicles, but ignore misbehaviour. In turn, they resort to frequently burning the plastic on site, sometimes in and around rivers, a practice that is frowned upon on account of it releasing toxic gases to the air. If officials do not collect and burn the plastic in due time, the waste ends up in waterways or worse, in the bellies of grazing animals. In fact, after collecting a truckload of trash, the aforementioned ranger had to temporarily store it in his employer’s property as the park officials could not offer a better alternative for disposal. He expressed his willingness to keep the collected waste without protest, recounting the emotional experience of coming across elephant dung laced with plastic wrappers. Sadly, this situation is not unique to Yala. 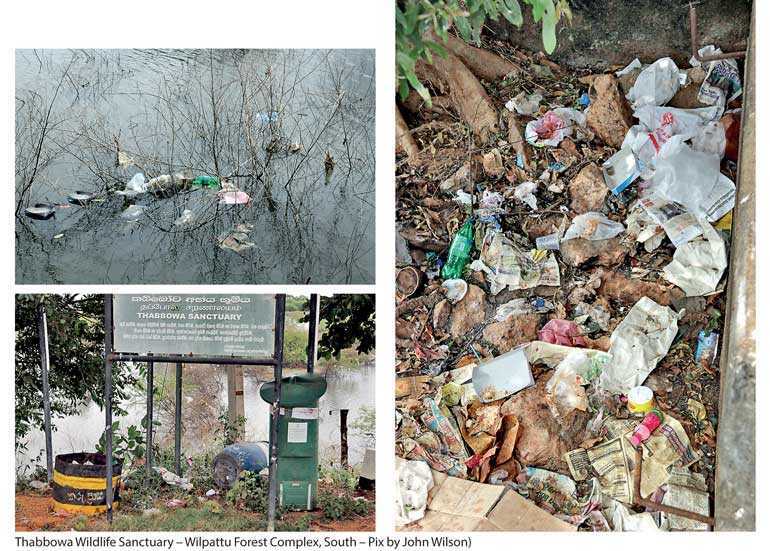 Photographic evidence from Thabbowa Wildlife Sanctuary (located in the southern sector of the Wilpattu Forest Complex) also show a similar pattern of disregard for the proper disposal of plastic materials. As of 17 August (over a month following the end of the pilgrimage), visitors claim Kumana National Park is yet to be cleared of the litter from the Pāda Yātrā. With the recent demise of six elephants from toxic-waste poisoning at the Deegawapi dumpsite, the loss of wildlife due to man-made garbage is a very real and immediate threat. Field guides often organise clean-ups to clear certain areas but agree that it is not a sustainable method of handling the issue. Although many have raised questions and made recommendations for implementing spot fines to reduce littering within the parks, no legitimate actions have yet been taken. The problems are many but the solution may be a simple one: better management. Some may argue that this is easier said than done. But we need not look too far for some inspiration. Rwanda first implemented its strict ban on the importation, production and usage of plastic items in 2008. Exceptions were made for hospitals, certain hotels and supermarkets, with only a select few allowed to produce non-degradable goods. Ill-disposed plastic caused many problems for the country before the ban, particularly in urban areas where it obstructed drainage systems and threatened public health and safety. Officials even search and remove illegal plastics found in tourists’ baggage at the airport before they enter the country. The Government’s strong stance on the preventative laws has allowed the country to change its industries and consumer patterns in such a way that ten years on, Rwanda is not only a plastic-free nation, but is a burgeoning tourist attraction. The clean cities are inviting more foreigners into a country with a recent violent history much like our own. So why is Sri Lanka having trouble escaping a slow suffocation by plastic, or at least preventing it from interfering with important ecosystems? Can it be blamed on our lack of interest in improving management strategies? In his political career, our current President twice attempted, unsuccessfully, to ban polythene. The most recent overnight ban fell flat after receiving backlash from aggravated vendors. The difference between Sri Lanka and Rwanda, in this instance, is that the latter held its ground against criticism and fully implemented the ban ensuring gradual change. In Sri Lanka, the banned strands of plastic are still produced and sold illegally. Although overall consumption patterns have shown some changes, the impact is not strong enough to be of long term significance. This is evident in the casual manner in which people still continue to use and dispose of non-degradable materials. With no attempts at educating people and no penalties in place, there are but little changes in behaviour. On the other hand, the Government has failed to provide a framework or infrastructure for the appropriate disposal of waste in one of the most frequented cultural destinations in the country: Kataragama. Allowing a large dumpsite to form on the periphery of a famed national park with only recent attempts at sorting and managing the disposed material, the Government is too far behind on doing the needful where waste management is concerned. And so, the plastic menace has successfully forced its way into our beautiful and highly-lucrative safari parks with promises of dire consequence. There is no question that exotic wildlife is one of our most lucrative tourist attractions, and the mismanagement of national parks not only threatens the beauty of our nation but also its economy. There is hope among the rangers, guides and conservationists working today but their ideas and suggestions fall on deaf ears. Park officials, also eager for changes, receive no support and remain overwhelmed by the increasing demands of an industry they are ill-equipped to oversee. The DWC is working at a snail’s pace either due to a lack of resources, a lack of expertise or both. Consequently, plastic is now openly threatening our wildlife as well as the longevity of our eco-tourism. The struggle will continue until a strong leader takes charge, and listens to the concerns of those who are passionate and aware of what is inevitably coming. In the meantime, let us appreciate the individual efforts of those concerned few, who are working in the field and cleaning up after us every day. Let us not hope incorrectly that tourists are partial to plastic safaris, or that our beautiful wild animals will acclimatise to a polythene-based diet.